Using reclaimed wood in the home has been popular since the 1980s, but only in the last few years have we seen such a surge in this green remodeling design idea. 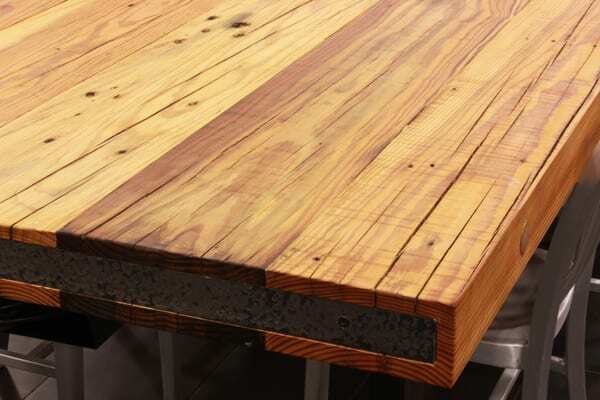 Reclaimed wood is wood that finds a second life as your new kitchen countertops (or a variety of other uses) after being reclaimed from a barn, factory, warehouse or other old structure. There are many benefits of installing reclaimed wood countertops in your kitchen, but there are also aspects of this material that make it less suitable for certain kitchens, lifestyles and designs. Here are the pros and cons of using reclaimed wood kitchen countertops to help you make the right decision for your home. 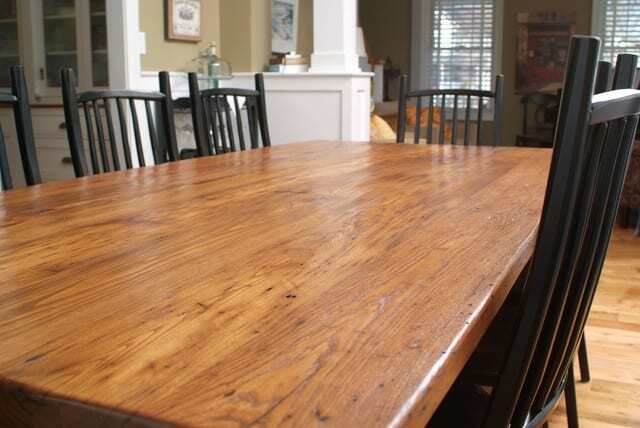 Reclaimed heart pine is a gorgeous choice for table and countertops. Reclaimed wood is sustainable: It’s well known that using wood, unlike natural stones such as marble and granite, is an environmentally sustainable resource because wood is renewable. Reclaimed wood is even more sustainable because it’s essentially recycling a renewable resource for double the use. Rather than demolishing an old barn or other structure, the boards are carefully taken down, refinished, and resold for an entirely new purpose. Using reclaimed wood is arguably the most sustainable method of getting new kitchen countertops and contributes significantly towards the green building industry. In fact, using reclaimed wood can make your project LEED Certified and FSC Certified, depending on the species, qualifying your home for special benefits. Reclaimed wood has a unique appearance: Unlike newly sourced wood, reclaimed wood has been weathered for many decades which gives it a different look. Reclaimed wood will have a unique character to it and look aged and charming, offering a traditional or historical style to your kitchen. Reclaimed wood is strong, stable and durable: Thanks to the several decades reclaimed wood has spent in the elements, it has expanded and contracted due to changes in humidity countless times and settled into its final state for a more stable, durable and strong wood plank that can easily stand up to the hardships of kitchen life. Many different wood species are included: Because old structures used a number of different wood species based on the area there are several different woods available among reclaimed wood species. Plus, many woods are only available through reclaimed wood and cannot be purchased new, providing a more unique look for your kitchen countertops. Species such as American chestnut and longleaf pine, which once were abundant but are no longer, can be found by sourcing from reclaimed wood. Many of these older species are especially strong, making them suitable for a second life in your kitchen. Reclaimed wormy chestnut is a finite resource as the species was decimated by the insect that gave this wood it’s nick name. Scarcity: Unfortunately (or fortunately, depending on how it’s perceived), reclaimed wood has become so popular for use in homes in recent years that it has become less available. While reclaimed wood is a recycled material, it is in finite supply because there are only so many old barns and warehouses with usable materials in the country, and eventually the supply will run out. This is great for the environment because it means that all of that wood has been reused and saved from the landfill, but not so great for homeowners hoping to get some of that for their kitchens. Cost: Reclaimed wood has actually become more expensive than newly sourced wood because of the additional costs of sorting the wood species and preparing them for use inside homes. There’s also the additional cost of dismantling the old structures to preserve their wood rather than a quick demolition, which gets passed along to consumers. 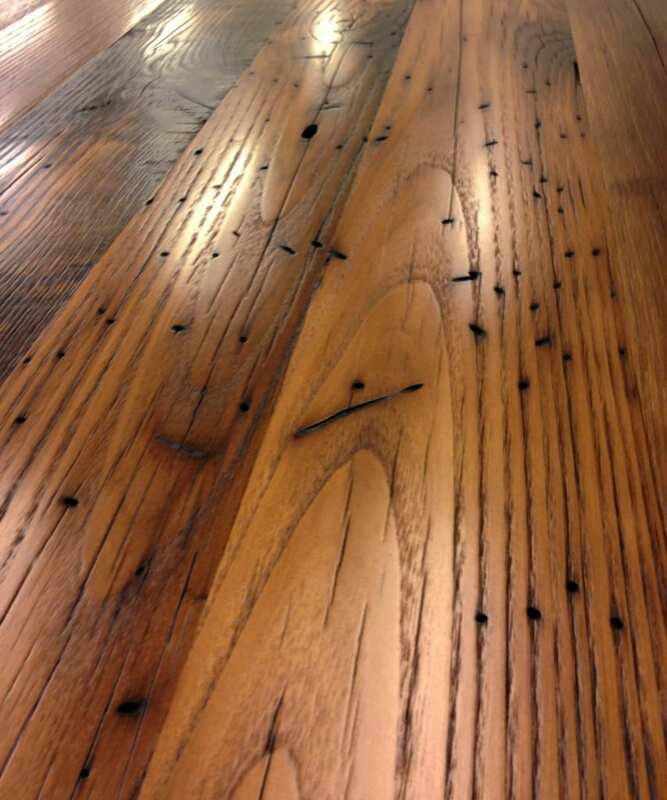 Not to mention, reclaimed wood’s popularity is making it scarcer, which makes existing supplies more valuable. Legitimacy: Consumers sometimes have to make certain that the reclaimed wood they purchase actually is reclaimed wood, not a blend of old and new woods passed off by less than reputable retailers looking to fill a void in the market and make a quick buck. Previous wood treatments: Wood that has been reclaimed from old barns and warehouses might have been treated with chemicals that are now recognized as being toxic, and there’s almost no way of knowing which pieces have been treated and with what. Substances such as lead paint and volatile organic compounds (VOCs) can be present in the reclaimed wood, so ask your supplier about the risks associated with reclaimed wood origins. Reclaimed wormy chestnut with all its wonderful character.